HURRAY!! My second book is out, and I’m very happy. This book is a bit of a departure from the first one. The Right Ingredients is a contemporary Christian Romance. 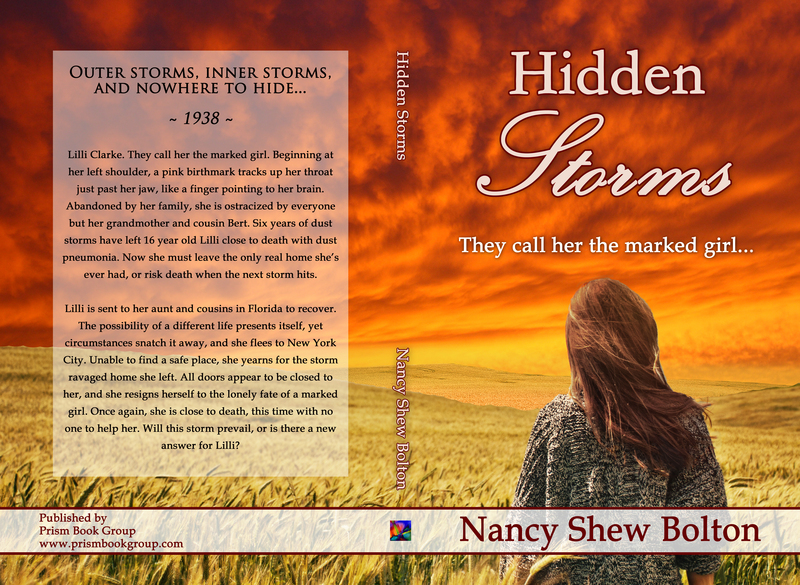 Hidden Storms is historical Christian fiction set during the year 1938. A storm-tossed year, and a life-changing one for Lilli Clarke, the young woman who tells her story as it happens. I will include the endorsements here, and an excerpt to give you an idea of this unique story. Hidden Storms addresses issues most of us, like those around Lilli, would much rather avoid—those we’d rather hide than deal with. A suspicious, superstitious, and prejudicial upbringing ingrained in young Lilli that she was marked by God and the cause of disaster wherever she went and whoever she touched. We might all feel that way sometimes without a champion or a kind word that triumphs over our self-doubt and pity. Nancy Bolton gives us an enduring story that will mark our hearts. Nancy Bolton’s gripping tale of a young woman’s overwhelming shame is set against the tragic dust bowl years. Nancy’s descriptive voice sends you right back to that difficult time period as you struggle right with Lilli Clark as she strives to recover her health. Yet it’s not just health that Lilli needs. It’s redemption—God’s redemption. This story, Hidden Storms, molded after the fairy tale, The Ugly Duckling, really exemplifies how God takes us, sinful, filthy, ugly and unacceptable, and wipes away all our hideous flaws and makes us whole. Follow Lilli as she trudges towards God’s truth, learns to accept her imperfections, and embrace a new life free of shame. Hidden storms took me back to the dust bowl era, a place I’d never want to live within. The imagery was so vivid, though, I felt like I was there. I followed the character through her trying ordeals and when I wasn’t reading, I thought about her. I’m a mother of two young girls and I don’t get a lot of reading time. This book was time well spent in every way. The characters were riveting and the important themes underlying the plot took center stage by the end. My biggest question is, can there be a sequel? I want to see what happens to the young girl! Nancy Bolton weaves an amazing, timeless tale, told through the eyes of a teenage girl in pre-WWII America marked by tragedy as long as she lets past injustices define who she is. Bolton’s descriptions are so rich and vivid, they yanked me into the plot at the first sentence and never let go. My time grows short, while my fevered brain wonders if I’d ever existed to begin with. The inevitable stands before me. The world consists of nothing more than wind and dust, endless storms swallowing all life with their voracious appetites. If I want to, I can rise from my bed and struggle outdoors in my threadbare, flour-sack dress to stand and release the spark of life within me. To let mind, body, everything, disappear into the whirlwind. Its ceaseless roar can consume me at last and perform the final conclusion left to my imagination. My sixteen years of life at its end. Six years of dust storms had almost done the job anyway. Might as well let them finish it. But I can’t go. I won’t. I don’t know why. One more breath. A rattle and rasp scrape in my chest while I fight to draw in air through the wet cloth covering my face. I’ve lost the remembrance of the former blessing of easy breathing. Now, my entire will bends toward the intake of air that will feed the tiny flame of life inside me. My grandmother’s hands adjust the cloth. I know she sits by my bed and wills me to breathe while the duster pummels our home. She and I, the only ones left in the howling world, are cut off from everyone else as though we lived alone on the moon. Is Cousin Gerald’s house really down the road, he and Bert hunkered inside? Is the town still there somewhere, standing against the shrieking monster clawing at it? Perhaps, once the sounds cease, anything left alive will creep out to view an endless brown world of dust, all signs of human habitation wiped away. Why do I try so hard to stay alive? Let me go, Gram. Ask me to give up. But her fingers smooth back wisps of my hair, and the low sound of her murmured prayers gives me something to focus on, along with my labored breaths. Anything but the sound of the wind and the dust scouring the house, trying to destroy our tiny lives and meager possessions. Another lifetime ago. Our garden. Greens, corn, and potatoes to have with side meat. Cucumbers for pickling. Berries for dessert. Oh, Gram, those days are long gone. Swallowed in the dust. I don’t care if there are trees or grass somewhere. I can’t leave you. The only one who ever loved me. I’ll die here, with the sound of your prayers disappearing into the wind, along with my last breath. I’m sorry, Gram. Maybe the silence woke me. Had I finally died? My eyes blink open and the ever-present grit hurts my eyeballs while I survey the room. The weathered clapboard walls and roof still stand. I lift a pale hand and study it. I’m still here, too. The front door yawns open, and the two windows on either side are un-shuttered. A portion of cloudless blue sky shines above the flat, brown landscape. I draw in a shaky breath, relieved that only a slight rattle sounds in my chest. Voices flutter in from somewhere on the porch. If I had enough damp in my eyes, I might cry. How unfair people are. It always surprises me, though by now I should have wised up. My heart breaks for Gram. Maybe he’s right. Nothing has gone well for her since I came. The few pleasures she did enjoy have been stripped away. Invitations to social gatherings and friendly drop-by visits have dried up like the creek in our back yard. People avoid her, even at church, because she brings me there. They say God marked me, like Cain, though I never murdered anyone like he did. But murder followed me anyway, so they say. His eye is on you, Gram. But He doesn’t care a lick about me. Why do I have to go live with Great-Aunt Margaret? I hardly know her, but she’ll hate me like everyone else does. Everyone except Gram and Bert. I heave out as big a sigh as I can manage and drift back to sleep. The smell of food cooking wakes me and Gram’s soft singing from the porch makes me smile. Bert will come by soon, like he does every afternoon. I roll onto my side and sit up on the edge of the bed. Dust plumes up from the mattress and settles on the floor, coating my bare feet. I stifle a cough. If Gram knows I’m up, she’ll leave her singing and come see about me. Let her have a few moments of enjoyment. She hustles in and settles her tall, spare frame next to me. Dust motes dance in the sunlight from the windows. The sight of her heart-shaped face and gentle, blue eyes always cheers me. I get my baby-fine, brown hair from her, and my blue eyes, but not her calm, even temper. Or her hopeful faith. She studies me and pats my left shoulder. Nobody else except Bert ever touches my marked shoulder. I nod. While she fetches a bowl and wipes the dust out of it, Bert’s tall body comes into view across the yard. Bert pulls out one of our chairs and parks himself. Heads bowed, Gram gives thanks while I peek at Bert’s dusty head and shoulders. Years of short rations had carved any extra flesh off his sturdy body. We all look the same now, rangy as starved wolves. The watery jackrabbit and turnip stew is devoid of fat, like we are. Fat. The days of butter melting on vegetables, glasses of creamy milk, and stews made with fattened meat, are the stuff of fond memory now. The crispy fat of a pork chop haunts my dreams. If it weren’t for food relief, we’d live on thistles. Though hungry, I had to force down the stew. What’s the sense of hanging on? How many more awful stories can I bear, how many more storms? If I had the strength, I’d jump up from the table and run, past all the dust. Faster than an automobile. I’d outrun all of it. But not without Gram or Bert. Does she hang on for me, the way Sam Gordon had for his last living child? With my family gone, she wants to leave the farm to me. She says someone with our blood has to remain. But there is no farm. Only acres of dust. Once she sends me from here, will she give up? No, she’ll still have Cousin Gerald and Bert. And all the folks in town will come around again once I’m gone. I can see that. They’ll greet her at church the way they used to, with big smiles, not the careful nods they dish out now. I’m tired of it all. Tired of being judged. When I go, Bert and Gram won’t have to stick up for me anymore or try to keep me alive. At least I have that much to hold on to. This entry was posted in Uncategorized and tagged Bolton, DIY, Lilli Clarke, Nancy Bolton. Bookmark the permalink. Congratulations, Nancy! I’m working on reading it right now and hope to post a review soon. Just bought the book Nancy. I look forward to reading it. You are amazing. I’m so excited to see this story in print!!! Congratulations Nancy. Can’t wait to see what else you do. Miss you. Thanks, Erin! I miss you, too! Can you post a review on Amazon for this story? Also, I’d love to hear your news. Can you email me?